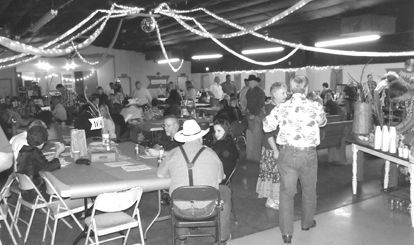 CROSBY  The Knights of Columbus Hall was a setting last Saturday night for a brilliant success to fund special courses for students at Crosby ISD. Some 260 folks bought all the seating and it looked like plenty would be standing for most of the night at the Crosby Education Foundation Boots & Jeans Gala. The gala featured live music, dancing, a fajita dinner and an auction. The special courses were requiring extra funding and asked for provision by local teachers. The charity event raised money to fund those courses and thus provides a higher quality education for local students. The top selling item was an autographed, and framed Earl Campbell Jersey from back in the Houston Oiler days. Johnny Manzell autographed and framed jerseys sold for about $2,500 each. Other items included fishing trips, hunting trips, hotel stays, spa packages, and luxury tours. Harris County and the State of Texas won a ruling from Federal District Judge Lee Rosenthal last week that helps clear the way for a trial of the Countys billion dollar environmental penalty case against Waste Management, International Paper and McGinnis Industrial Services. Judge Rosenthal sent the case back to the state court for a trial before a jury made up of Harris County residents. Harris County Attorney Vince Ryan filed the lawsuit in 2010 in state district court seeking civil penalties for the dioxin contamination caused by paper manufacturing and paper mill waste disposal practices dating back to the 1960s. 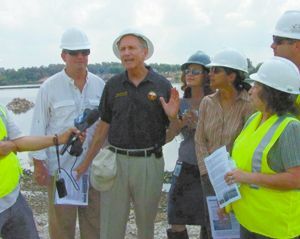 The lawsuit claims that Champion Paper disposed of hundreds of thousands of gallons of contaminated waste in unlined pits just north of the IH-10 East bridge and along the west bank of the San Jacinto River in east Harris County The site is currently the focus of an EPA Superfund clean-up. International Paper and Waste Management sought to transfer the case to federal court in August of this year. Harris County is represented by Vince Ryan, Harris County Attorney; Terry ORourke, and Rock Owens of the Office of the Harris County Attorney; and the Houston law firm of Connelly · Baker · Wotring LLP. The 18 months of construction have concluded. 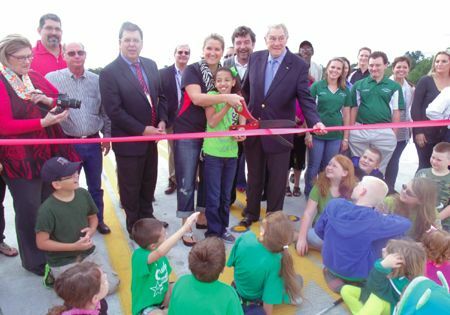 The overpass was first opened on Wednesday Oct. 16 as traffic was diverted to the overpass to finsih work on Kernohan and Oak Streets. All beems were in place over a month ago. In spite of opposition from varied sources and windmills of rumors about shutting down access from Huffman, the project continued with amendments such as lights to stop traffic to allow ambulances to exit their station. David Boehm of NGB Constructors spoke of the challenges persented by the project, the thrill of completion, his companys positive impression of the community and apperciaton of being asigned the project. Quincy Allen, TXDoT, P.E. Deputy District Engineer for the Houston District spoke next with much wit aand enthusiasm for a job well done. With Mr. Allen were Adam Galland, Allens Assistant John Elam the Area engineer and Danny Perez Public Information Officer all of TXDoT. Wayne Smith talked of his impression of Crosby being forward looking and of his interest in infrastructure. CROSBY  Nine people, including six law enforcement officers, have been charged with racing without a license, a felony punishable from two to ten years related to activities at Rancho El Herradero on Sralla Road, according to a release from the District Attorneys Office. An eleven month investigation turned up allegations of illegal racing and gambling at the 12402 Sralla Road location, south of FM 1942. 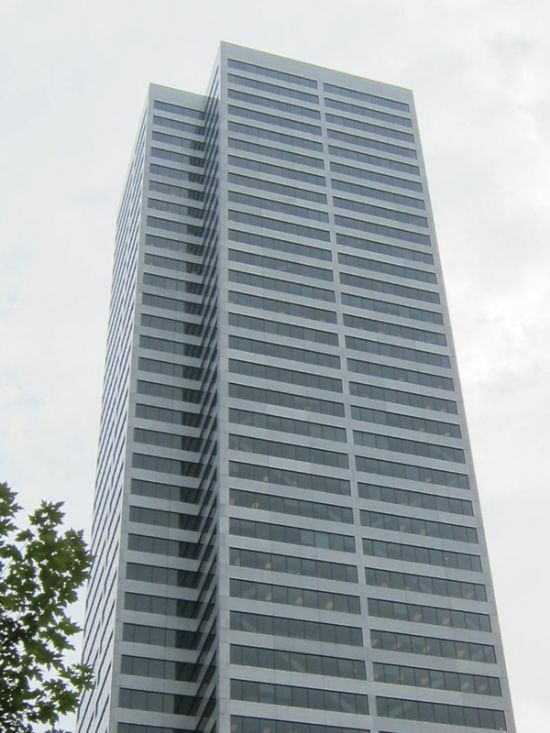 According to Teresa Buess, head of the Public Integrity Division of the Harris County District Attorneys Office, soon after the Department of Public Safety launched an investigation in November, 2012, the office in Harris County got involved due to the presence of law enforcement offices. The press release alleges that the law enforcement officers were providing security at the location. They were named as Department of Public Safety Trooper Richard Rivera, 57; Secar Guadelupe Rangel, 34, and Joel Garcia, 31, deputy constables with Harris County Precinct 1; David Green, 37, and Edward Scott, 34, reserve deputy constables for Fort Bend County Precinct 2 and Carlos Garza, 64, a reserve deputy in Maverick County south of here. The Deputy Constables from Fort Bend County were reportedly fired on the spot. Three arrested were civilians  Diana Marie Salinas, 19; Cosuelo Rivera, 61; and Reginaldo Mandujano, 53. Cosuelo Rivera, wife of Richard Rivera, was charged with impersonating a peace officer. According to the Harris County Appraisal District, Reginaldo Mandujano owns the property. All nine charged were freed on bail, according to records. At first the T.A.B.C. 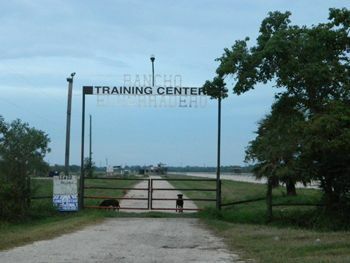 was alerted but the training center had been granted a beer and wine license in 2008. A sign near the grandstands indicated that gambling, outside food, and firearms were not permitted. It is said there are about 25 to 50 unregulated tracks across Texas. The Texas Racing Commission admitted that limited resources and frail relationships with law enforcement agencies makes it difficult to enforce state laws. One might guess a thousand training centers are a front for something, nobody knows. A referendum in 1987 made races one of the few legal gambling venues. A license ranges from $70,000 to $1/2 Million per year. Credit was also given to the US Department of Homeland Security, Texas Department of Criminal Justice Inspector Generals Office, Harris County Sheriffs Office and the Texas Board of Veterinary Medical Examiners. HIGHLANDS Annually for the last 56 years the Miss Highlands Pageant has been the centerpiece of community pride, here. This year the goal was to find new representatives of all that is best about this community having had those posts so well represented by Casie Russell and McKenzie Reznicek as Miss Highlands and Junior Miss Highlands. The theme this year was the lively musical Grease that starred Olivia Newton-John and John Travolta. The principal sponsor of this event is Highlands Horizons with active participation from business and civic entities. The podium was aptly manned by Capt. David Alford and Miss Highlands 2012 Casie Russell. Miss Russell sang a rousing opening with participants dancing for ceremonies. The lovely array of contestants was introduced next. There was a sportswear presentation followed by an outstanding Talent Show. Stacy Lineberry sang a sophisticated entertainment segment. During the evening gown presentation contestants were asked what is most challenging for teens today. Maegan Linck was recognized for high ticket sales. Miss Congeniality was Madeline Walker. Miss Photogenic was Taylor Moser. Hannah Noel and Elizabeth Keyes split the talent contest. The Jennie Robbins Community Service Awardee was Heather Plant. Katlyn Burns was second runner up. Madeline Walker was first runner up. Taylor Moser is the 2013 Miss Highlands. The Junior Miss Highlands was held prior to the event of Miss Highlands. High ticket sales was won by Kay-Leigh Benson. Miss Congeniality was Jordan Gwaltney. Haley Maxey was Miss Photogenic and the Talent winner was Sadie Aiken. Anna Keys was chosen Junior Miss Highlands. Destiney Bogie was first runner up. Sadie Aiken was Second Runner up. HIGHLANDS  Pct. 2 County Commissioner Jack Morman brought his message of progress in the Precinct to the Highlands Lynchburg chamber luncheon, last Thursday, Oct. 10. 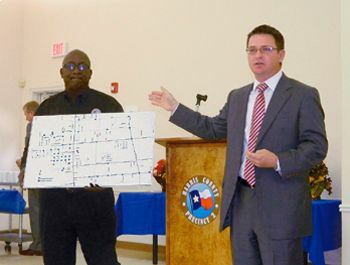 Calling it The New Precinct 2 Morman talked about initiatives to eliminate or control game rooms, and related crimes. He spoke also about a program called Safer Streets 4 Schools, which will improve access for children walking or riding to school, by providing sidewalks, and improved intersections and queue lanes. He noted that the court battles were over on redistricting, and voters did not need to worry now about district lines. He now has 15 cities within his precinct. He services the area with 380 employees. Morman said his budget is balanced and in good shape this year, and he will be able to add 25 streetlights to the Highlands area. He mentioned two issues that will be on the ballot in November. He is strongly in favor of a joint processing center, a joint city-county intake facility for arrested or detained individuals. The other ballot issue is a vote to save the Astrodome, with a related small tax increase. He is not in favor of this item, due to continued expense and an undefined purpose for the building. Morman said that future projects include a new landing at the fairy, and major construction and enlargement of the East Belt and the bridge over the ship channel. He said the budget will exceed $1 Bil. HIGHLANDS  Happy Happy Happy was the theme for the 57th Annual Jamboree this year, and it seemed to have an effect on the crowds, who sported long beards and camo and woodsmans clothes as you might see on the popular TV show Duck Dynasty. Many of the floats had a backwoods flavor to them. A large crowd turned out last Saturday, for the traditional events, which included a Fun Run/Walk to start the morning, a long parade with many units, a car show, crafts booths, silent auction and talent events in the Elementary School auditorium. The Jamboree is a fun and fund raising event for the Chamber of Commerce, who also presented their community awards during the day. 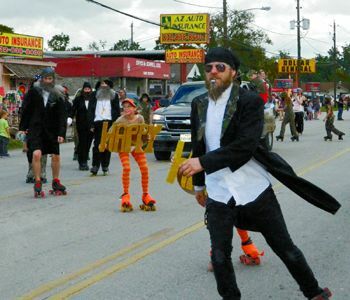 Judges for the parade were provided by Kohls in Baytown, and the Fun Run benefitted Habitat for Humanity. This award is the top Chamber award to someone in the community that consistently helps make Highlands a better place to live. This year it was given to the masons of Sampson Lodge #231. This Jamboree related contest will take place next weekend at the Highlands Junior School Auditorium, 2 pm for the Jr. event, 7 pm for the Sr. judging. CROSBY  The social event of the year was the Cody Stephens Go Big or Go Home Memorial Dinner at the American Legion Hall on Saturday, Sept. 28 and raised funds for heart screenings for high school students throughout the state. 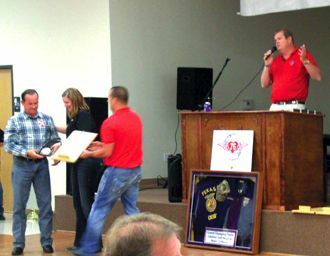 The event had as Master of Ceremonies Scott Stephens and featured a live and silent auction that was conducted by volunteers of the Crosby Fair & Rodeo, including Bill Busby as auctioneer. According to Stephens, the event raised enough to perform about 13,00000 heart screens but, he has bigger plans. We are going to approach some of the bigger heart health associations that really make a difference in Texas and get the dominos falling where the testing is just standard procedure, Scott told the Star-Courier. Early, Don Vickers sang a song that Stephens and Larry Holder wrote entitled , Go Big or Go Home. It is on the Cody Stephens Memorial Website for those that wish to hear it. When Stephens told the audience the sentence from his son, Cody, that the Memorial Fund was named for a standing ovation from the packed house resonated the walls. Go Big or go home, also resonated in the hearts of the listeners. During the event Scott Stephens told this assembly of the tragedy that lead to the initiative to screen for heart problems in students, In May 6, 2012, Cody Stephens was a few weeks from graduating from Crosby High School, and looking forward to showing his pig, steer and lamb at the Crosby Fair and Rodeo in June. 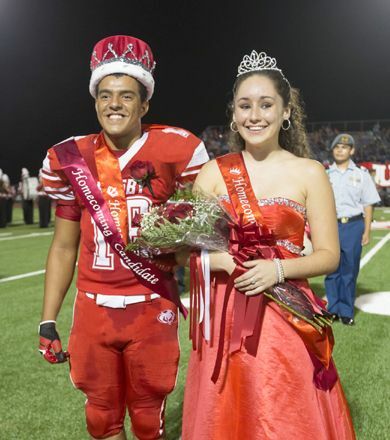 He was also excited to be headed to Tarleton State University on a football scholarship, and working to stay in good physical condition to be prepared for college football practices. Most local elected officials were in attendance including both Precinct 3 Justices Parrott and Coffey, Constable Ken Jones, and Texas House Representative Wayne Smith, R. 128, District along with Sylvester Turner and got extra recognition for sponsoring House Bill 1319, the Codys Law. Wilton Schexnayder of Oilwell Tubular Consultants, Dan Meaux of Crawfish Shak, and Sheryl Roppolo (formerly of Judge Mike Parrotts office) got extra recognition for their financial and organizational assistance. According to Stephens, Cypress ECG project, Guardian EMS, East Houston regional hospital and Liberty Dayton Regional Hospital, these guys actually do the screenings. 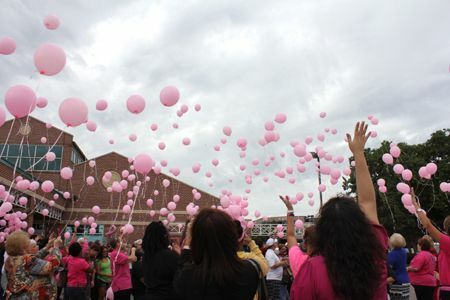 And the following are the school districts that the Cody Stephens Memorial Foundation Go Big or Go Home has touched: Alvin, Bangs, Barbers Hill, Baytown Christian Academy, Bastrop, Beaumont, Brownwood, Bryan, Channelview, Coleman, College Station, Comanche, Conroe, Crosby, Dayton, Dickinson, Galena Park, Gatesville, Goose Creek, Hampshire-Fannett, Hardin, Humble, Industrial, LaPorte, , Liberty, Lubbock, May, Pearland, San Angelo, San Jac College, Santa Anna, Sheldon, Spring, Stephenville, Texas City, W Hardin and Zephyr. Deer Park, are you reading? In honor of Octobers National Sudden Cardiac Arrest (SCA) Awareness Month, Screen Across America, a coalition of organizations from around the country that provide youth heart screenings, launched a new website -www. screenacrossamerica.org – to draw attention to the prevalence (and locations) of heart screenings in the United States. SCA is the leading cause of death of student athletes. According to the American Pediatric Association, SCA kills 2,000 children a year in the United States. The new website depicts a map of the United States. Forty-five organizations, both for-profit and nonprofit, that conduct at least two screenings per year, are identified by a virtual push-pin. When a user rolls over the pin, the name, city and website of each organization is provided. Despite it being a vital organ, children in the United States do not receive a comprehensive heart screening. In most states, school districts require students to undergo eye exams, hearing screenings and scoliosis screenings. The common goal of the organizations participating in Screen Across America is to make heart screenings a standard of care for students.